The new Honda Stage YouTube channel has been lauded in the trades lately, with AdWeek previewing it in early June and Fast Company featuring it in their July article on YouTube CEO Susan Wojcicki. We took a look at the channel, using our VideoAmigo.com SaaS platform, in order to get a first-hand look at how Honda’s channel is performing. The Wall Street Journal mentioned a couple of the insights we surfaced, but we wanted to share all of what we found, and a few thoughts on how Honda might use this channel to build an audience of their own. Many of these insights and strategies are applicable to any channel — not just a large automotive brand — and you can find data on your own channel using VideoAmigo. Is Honda Stage worth the hype? Why are people talking about it? Let’s take a look at what it is, what it’s trying to do, and then put some odds on whether we think it’s going to work. Since erecting the channel, Honda has uploaded eight videos. The first six went up immediately when they started the channel. A month later, in early July, they uploaded two more. The current content teases the tour(s), and it’s all quite short, all less than two minutes long. The teasers are a mix of band interviews, behind-the-scenes footage, and some performance footage. The bands featured are similar: indie rockers with what we’d call an “anthemic” feel. The bands don’t have huge audiences on YouTube themselves; none of them exceed 50 million views. Grouplove, for example, which has about 28 million views on YouTube, had an iTunes hit a few years back and is still slugging it out as we all do on that road to the top! American Authors has a very similar sound and has nearly 40 million views on YouTube. It would appear that Honda is trying to catch a rising star with this mix of bands. At this barely-there start-up point, Honda has about 48,000 views and no subscribers. (Hey Honda: whomever put up your channel needs to go back and subscribe, as does everyone at the record company, Clear Channel and Honda!) As for the 48,000 views, it’s not a bad number of views for a new channel. However, the lack of subscribers leads us to believe the views were purchased. Nothing wrong with paid advertising; they need a way to kick this channel off. But now the contest begins. We calculated Positive Passion for the Honda Stage channel. Positive Passion represents the percentage of viewers who click the Like Button. Honda Stage is generating Positive Passion of .53%. That’s about the same as a banner ad, and, interestingly, that’s just a little higher than the Converse channel’s Positive Passion rate; another brand using the Honda Stage strategy. According to VideoAmigo standards, that’s very low Positive Passion for a music channel, which means both Converse and Honda have a lot of work to do. When Honda uploads actual tour content, this will be an important figure to watch. So far, Honda has little to no brand integration on this channel. The name of the channel is the only place you see Honda. 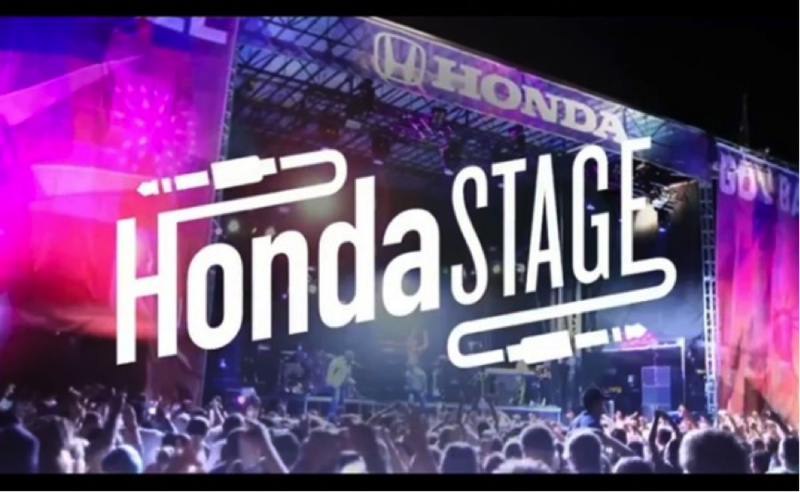 The main Honda channel does have a playlist featuring the Honda Stage content. Those views will accrue to the Honda Stage channel. So that’s what’s happened so far. Now what? Is this a good strategy for Honda? It is a great strategy, but only if executed right. And that’s exactly where so many sponsorships in general, and YouTube channels specifically, fall flat. Music should be an obvious win. It is such a powerful way to engage and build an audience. That’s why music tours exist… fans love them. A brand sponsoring a music tour is saying to millennials, “we like the things you like, and we help make sure you can enjoy them.” The affection and connection should come part and parcel with the deal. Besides, what else is a car going to talk about on YouTube its airbags? The right strategy for YouTube is to put up content that isn’t about the brand, but instead aligns with what their consumers care about — no matter what kind of brand you are. So big points on this for Honda. But, to make any of this work, you have to execute really well. Starting with the concert tour! We shouldn’t judge Honda’s YouTube channel as if it’s something unto its own. It’s part of a much bigger sponsorship where Honda will surely get other benefits. We can all hear in our heads the live radio remotes that will offer free concert tickets for “comin’ on down for a test drive. We can visualize the Hondas on display as we make our way from the ticket gate to our seat. These tours will surely have all that, plus signage and media, and for the Honda marketers they’ll have their fair share of standing in stifling tents plucking jumbo shrimp from bowls of melted ice while wearing matching t-shirts and name tags. The concert sponsorship formula is written, but not on YouTube. At least, not by the brands. YouTube is the vehicle that will make sure this concert sponsorship gets noticed by the heavier half of people who will never attend the local concert or notice the local media. There’s an adage in the sponsorship world that says, “for every dollar you spend on a sponsorship, you need another dollar to activate your sponsorship.” Rarely do sponsors achieve that 1-to-1 ratio, but now, when you can rely on YouTube to really crank up the marketing heat, brands need the extra dollar more than ever. Executing on YouTube isn’t about posting and praying. That’s how you lose. Let’s look at and learn from others who have gone before. There’s a long list of brands to go before Honda, sponsoring a music tour and building a YouTube channel around it. But let’s take note of Converse’s concert tour-focused channel. Converse competes with DC Shoes. DC Shoes‘ YouTube channel is more than 22x the size of Converse. DC Shoes features skateboarding content; Converse features music. Is skateboarding content more popular than music? No, music is far more popular on YouTube. So what’s the difference? Execution. How about Mountain Dew’s Green Label Sound YouTube channel? Mountain Dew competes with Monster Energy drink. Monster’s YouTube channel is 5x the size of Mountain Dew. Monster features various adventure sports; Mountain Dew features music. Are adventure sports more popular than music on YouTube? Not even close. So what’s the difference? Execution. The most popular music publication is Billboard. It has more than 404 million views. Converse has 15 million views. Mountain Dew has 14 million views. Honda may not care to think of Billboard as a competitor, but Billboard shows what’s possible for concert and music-related footage because their execution is spot on. Honda Stage needs to market its channel. “Market” is not synonymous with “buy pre-roll” for it. What we mean is act like a YouTuber if you want to get the results YouTubers are getting. Act like a publisher. Care about growing a YouTube audience. YouTube Audience Development is an entire discipline that many marketers haven’t yet figured out exists, but that’s where the organic views come from. Will there be a place for paid advertising on YouTube? Absolutely. But if Honda wants its advertising spend to be efficient, pre-roll is the follow-on tactic, not the lead horse. Honda needs to create truly original content from these tours. YouTube is overrun with music content, particularly when it comes to bands that strum in this part of the musical stratosphere. There are hundreds if not thousands of those middlin’ indie bands, all with their own channels, all with fan sites, some with VEVO channels (signed artists), all being covered by the music press. Because video content is free promotion for the band, when fans steal it for their own channel, record labels have a spotty record of protecting their content rights. Therefore, when it comes to band interviews, band footage, and even pirated non-VEVO music videos, they are everywhere you look on YouTube. This means it’s going to be very important for Honda to create truly original content from these tours. Backstage interviews and behind-the-scenes stuff of almost-famous people only goes so far. Honda also needs to take the promotional assets that come with the concert tour and use them to drive organic views on YouTube. Do ticket giveaways, for example, and advertise those giveaways through the copy block on TrueView InSearch/InDisplay ads. Last and hardly least, Honda needs to market the Honda Stage channel through excellent YouTube playbook practices. This includes cross partnerships, proper content cadence, tight ties to Facebook, content distribution, and all that other good stuff. Running this channel is serious business, particularly given all the money that’s being put into these sponsorships and media. Let’s hope it’s being run by a YouTube pro — after all, we’ll know because the data will tell us.